DY: I like a lot of different styles and locations. As long as there is tons of wall space for bookcases, I’m happy. MW: An apartment on the Ile de la Cite, a loft in Berlin, a casita in Tulum, an apartment above a yarn shop in Lago Maggiore and a farm in Tuscany. While I’m dreaming, I want to keep my studio and my home in Providence. They suit me. I am extremely farsighted. I love big spaces and open floor plans. Lots of windows. I prefer stucco, stone and brick to wood framed houses. Small rooms and low ceiling make me claustrophobic. 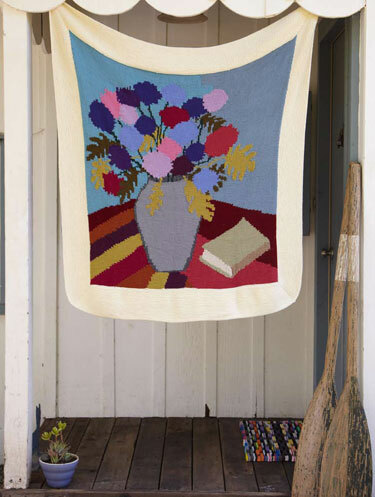 CR: How do you think knitting fits into home decor? DY: Perfectly in every room in the house! MW: That’s a good question. I have been literally surrounded by yarn for more than 40 years. I spend my workday hours in my loft studio. Now that I’m an editor, most of my yarn is in yarn binders. I keep bookshelves full of volumes of yarn from all over the world. I love to be in my studio but it has become more about books and words than ever before in my life. My home is my sanctuary away from my studio, yet I have a knitting basket with my latest project at the ready. I have used my home to showcase my afghans and throws over the years. When a friend falls in love with one I often give it to them as a gift to make room for another piece and to clear the decks for another palette perhaps. My eclectic mix of art and crafts and stuff keeps evolving, it keeps changing but I only keep things that relate to my aesthetic. Afghans are the perfect knitting “canvas” on which to express my love for textiles and fine Art. CR: When and why are you tempted to knit afghans and throws? DY: I always have a afghan/throw of some kind started. I’m tempted to do so simply because there are so many beautiful yarns and I don’t necessarily want to wear all of them. CR: Do you have any tips for making a larger project like this more manageable? DY: Work on them during fall and winter to keep you warm (you can lower the thermostat) while creating. MW: Just work on it a few minutes everyday and before you know it you will have a finished afghan. CR: You’ve knit your favorite blanket from the book and now you’re picnic ready! Set the scene for us. DY: Sunny Day shouts Hampton Beach to me. It is a favorite spot for my husband and me. Laying on the beach, eating homemade potato salad, with a sausage sandwich and fresh lemonade from one of the vendors…DH doing crossword puzzles and me probably reading something by Stephen King. MW: I would suggest Pinwheel for picnic. Since I can’t seem to plan a meal that is at all coordinated, I might be likely to have Asian, Italian, Russian, Mexican all in the same picnic basket! I am a knitter and a quilter. It just thrills my soul to see quilt patterns done up in knitting (or crochet). “Calico Hill” is quite similar to a quilted “Apple Core.” I would love to make Calico Hill to use next to my Apple Core, a work-in-progress. This book is absolutely beautiful! There are so many I want to make!! I’ve been hearing alot of great comments about it from CGS members, too. You all should be very proud of this project! Congratulations! !